Shane and Steve are celebrating 6 YEARS at Iron Clad!!! In the past, I’ve highlighted both of them together as the great team they are, but I think it’s way past due to celebrate each of them separately. Shane is up first and you now have a sneak peek into next month’s MOM. Shane learned of Iron Clad’s grand opening party 6 years ago through a running club buddy. She and Steve came to our grand opening party and were hooked. Shane’s sister was an RKC instructor in MN and had taught Shane some of the basics when they saw each other and also over the phone (!!!). So Shane already knew a bit about the benefits of kettlebell training but she really saw the full expression of that once she was able to attend classes regularly. When I say regularly, I mean it. Shane has been so incredibly consistent with her training over the last 6 years. The only times she misses class is when they are on vacation or suffering the occasional illness. They also do some supplemental kettlebell training at home, practicing the techniques they learn in class. Shane has seen so many benefits from training with kettlebells, both in the early days and after all of these years. 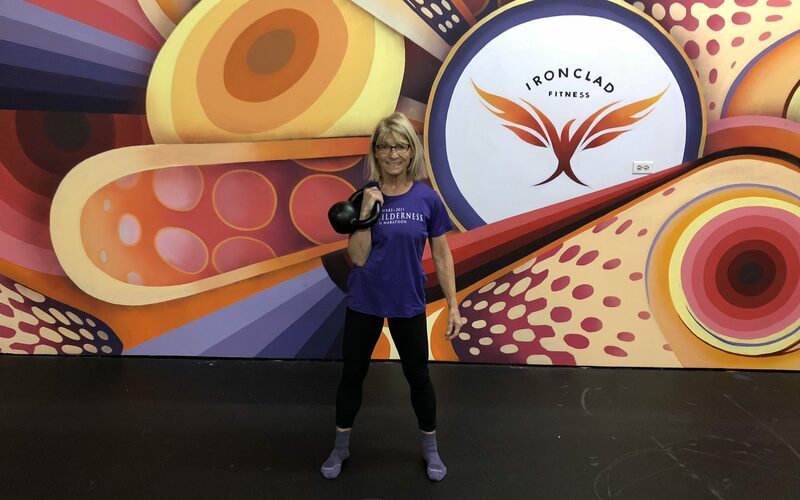 Shane often tells me how kettlebell training has improved her running both in her times as well as in how her body feels during her runs. She reports feeling stronger and more connected while running. Shane has been a runner since her late 20’s as well as an avid backcountry skier and rock climber. In fact, Shane and Steve met in rock climbing school, one of their first dates was climbing, and they later got married ON Cathedral Spire in Garden of the Gods. They climbed the 130-foot spire, changed into their dress and suit at the top and rappelled down to a ledge about 20 feet up where they had their ceremony!!! How’s that for adventurous? Shane had to give up regular rock climbing after getting a blood clot because the risks were just too high, especially for someone with a genetic history of blood clots, but she does still enjoy the occasional climb and she is still an avid runner and backcountry skier today. In addition to all of these accomplishments, Shane is one of the nicest people you will meet AND we are also celebrating her birthday this month. Congratulations on all of your accomplishments, Shane!